Just a week before the Clasico arrives, Real Madrid made sure they wouldn't slip up in their visit to Valencia to face Levante and ran over their opponents with a 5-goal win without conceding any. As usual, it would be Cristiano Ronaldo breaking the deadlock, and he not only scored the opener, but also completed his 5th double of the season. Javier Hernández with a great header in the first half, followed by James and Isco successful strikes after the break, confirmed the Merengues' 6th win in this league campaign. Next Saturday (on October 25), the stage is set for a thrilling Real Madrid vs Barcelona at the Santiago Bernabéu and the Merengues basically couldn't have asked for a better occasion to face their arch-rivals. With two massive games coming up in the next days, first for the Champions League at Anfield Road against Liverpool (October 22) and later in the week, a league fixture against Barcelona at the Santiago Bernabéu (October 25), Ancelotti was keen to rotate three of his usual starters against Levante. Iker Casillas played in goal, while the back four was formed by Marcelo, Nacho (replacing Sergio Ramos) Pepe and Carvajal. In front of them, Kroos and Modric teamed up to take the responsibility of dictating the pace and organizing most of the plays, while James Rodríguez and Isco were given a bit more freedom to support the attacking cast featured by Cristiano Ronaldo and Chicharito. On the other hand, Gareth Bale and Karim Benzema were given some rest and should be totally fit for the upcoming duels. The Merengues opened up the hostilities when Chicharito got brought down inside Levante's box in the 12th minute, allowing for Cristiano Ronaldo to score his first goal of the game and deliver Real Madrid the early lead. It's the Portuguese 5th goal from the 12-yard spot this season and he has now scored a total of 40 goals out of 43 penalty-kick attempts since he joined La Liga. In the 38th minute and following a long corner kick taken by Modric on the left, James Rodríguez ended up picking up the ball from a Levante's defender clearance near the edge of the box, which allowed him to cross it again as he tried to assist one of his many teammates that were still involved in the attack. He was fortunate enough to find Chicharito well positioned and free from marking, with the result naturally being a second goal for the visitors. The former Manchester United forward headed it past Diego Marino with ease, scoring his third goal in the league this season. The third goal of the afternoon was most likely the best of the game. Isco started the play just a few meters outside of the box of his own team, got past two opponents while running forward with the ball until the half-way line and then delivered it to Cristiano Ronaldo on the left. The Portuguese ace didn't want to look bad in the picture and also dribbled two Levante defenders just before he struck the ball with his right-foot and set the score in 3-0 for Real Madrid. 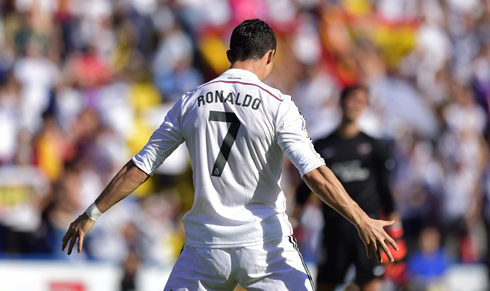 That was Ronaldo's 15th goal in La Liga this season after only 8 fixtures were played. This sets a new record for the highest scoring ever in Spain at this stage of the country's prime competition! Just 5 minutes after Ronaldo got his brace, James Rodríguez would also get the taste of scoring a goal. The Colombian was brilliantly assisted by Toni Kroos after making a run to breach into Levante's last defensive line, chested down the high pass and then volleyed it perfectly with his left-foot. Diego Marino barely had any chance to even get close to the ball and James netted his second league goal of the campaign. The final 0-5 result was set in the 82th minute and this time, it would be Isco who finally got to be the center of all attention in Valencia. 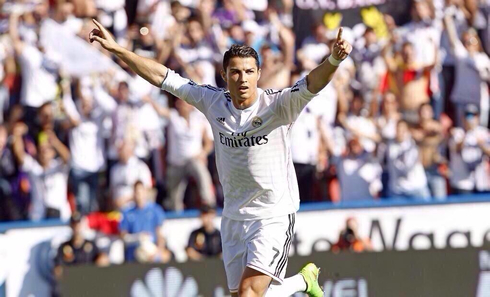 The Spaniard completed one of his best performances as a Real Madrid player by scoring a truly splendid goal. The former Malaga midfielder slalomed between a few defenders and then hit the back of the net to put the game to sleep once and for all... It's Isco's first goal this season, after having scored a total of 11 goals in 2013-14. Attackers: James Rodríguez, Cristiano Ronaldo, Chicharito. Cristiano Ronaldo next game for Real Madrid is a UEFA Champions League fixture against Liverpool, on October 18 (Saturday). You can watch Juventus live stream, Liverpool vs Real Madrid, Barcelona vs Ajax, QPR vs Liverpool, Stoke vs Swansea, and Hamburger vs Hoffenheim, all matches provided from our live streamings section.